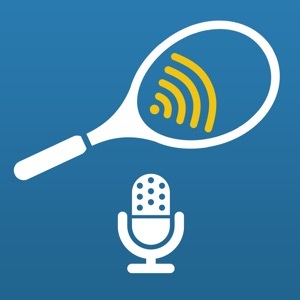 Listen to your racquet and perfect your game! RacquetTune ensures that your racquet is ideally suited to your style of play. 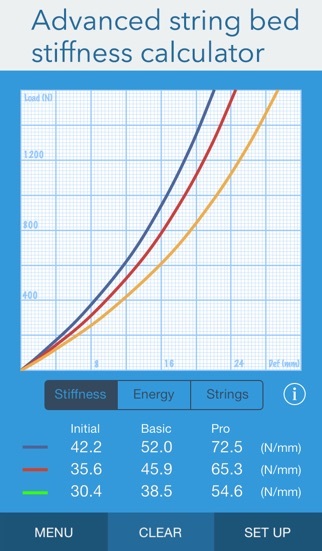 Simple and straightforward to use, the app uses the sound generated by tapping the strings to calculate the tension with high accuracy. In addition, the interactive swingweight calculator aids in customizing your racquet to fit your own stroke pattern, while the stiffness calculator allows you to simulate different racquet configurations. 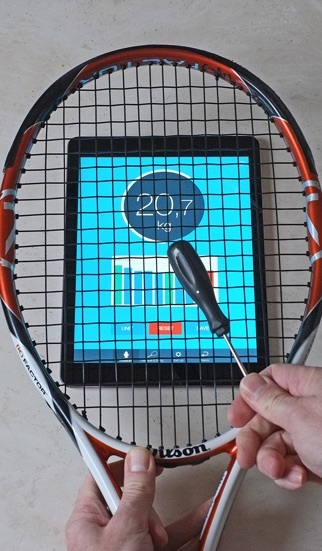 RacquetTune not only makes it easier to decide when it is time to restring, it is also an invaluable tool when testing different racquets and strings and in identifying which of your racquets is best suited for different types of games. RacquetTune also allows you to check whether your stringer is consistent in his work. RacquetTune includes the following user-friendly tools: Tension measurement - Quickly determines the tension and stringbed stiffness. - Able to detect changes in tension as small as 0.1 kg/0.2 lb. - An accuracy indicator ensures results are consistent. - Graphical presentation of sound waves helps you find the ideal way of tapping the strings. - Settings can be customized to serve tennis, squash, racquetball and badminton racquets, respectively. - View the tension history for each racquet as a list or a graph. - Email a spreadsheet with test data. 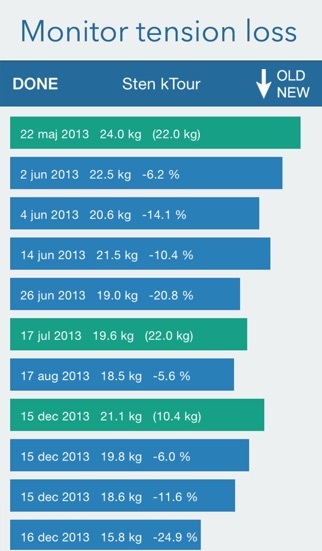 Swingweight calculator - Add as many weights as you wish to the frame. - Move and change weights to visualize how swingweight, balance and sweet spot location are affected. 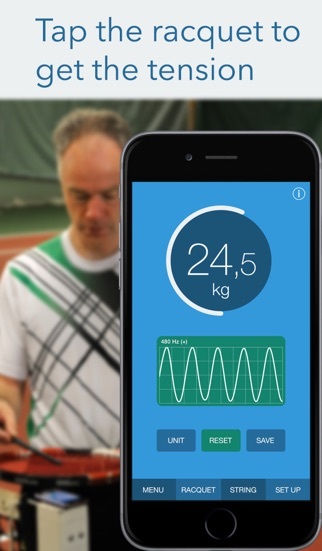 - Enter target values for the racquet and let RacquetTune distribute the weights automatically. 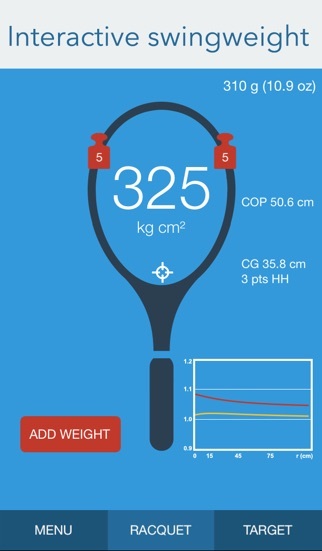 Stiffness calculator - Simulate various racquet and string configurations - Vary tension, string type and racquet head size. - Shows load-displacement curves, stiffness and elastic energies - Handles the large deformations encountered in actual play View a demo video at racquettune.com RacquetTune has been featured in tennis magazines in USA, Italy, France, Germany, Sweden and Norway. "The app is very, very impressive. I get more tension diagnostic questions than just about anybody in the universe, so this is a very good thing to be able to recommend." Jonathan Wolfe US Racquet Stringers Association Note, that the actual string tension in the racquet and the setting seen on a stringing machine are two different things and therefore incomparable - more information can be found at racquettune.com.